In a large mixing bowl, combine all ingredients (except the aioli ingredients and coconut oil) until all seasonings, veggies, and wet ingredients are consistent throughout the mixture. 15 minutes before you pull the crab cake batter out of the fridge, prepare your Hasty-Bake for grilling! Raise your firebox to sear level and place your cast-iron skillet on the cooking grills directly over the flame, close the lid to allow the skillet to become hot. 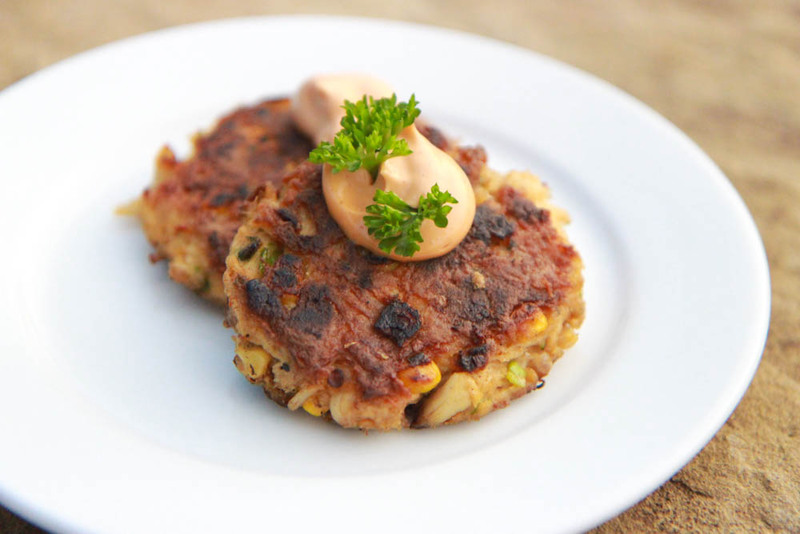 While your skillet is heating, prepare crab cake patties by taking 1/3 cup of the mixture and pressing it into a small patty approximately 3 inches in diameter and 1/2-3/4" thick. Remove patties from skillet, serve hot with a dollop of chipotle aioli. For chipotle aioli, this can be made ahead of time, combine ingredients listed above and refrigerate overnight.